The Greek Olympic Champions of Martial Arts and Weightlifting choose SPORTCAMP for their training. SPORTCAMP has successfully hosted training programs and camps for all Martial Arts & Heavy Sports. The fully equipped and contemporary facilities of SPORTCAMP create the ideal environment, while the climate conditions in the area favor the athletes in their effort to achieve the maximum of performances. Within its facilities, SPORTCAMP has a variety of training rooms of different dimensions that could accommodate any tatami for the needs of TAE KWON DO training. Our team is quite experienced in hosting several training programs and other competition events for some of the Greek Olympic Champions of TAE KWON DO, such as Alexandros Nikolaidis, Michalis Mouroutsos, Areti Athanasopoulou, Elli Mystakidou and many others. National Teams from as Israel, Mexico and the Netherlands have also completed their sport training in SPORTCAMP. 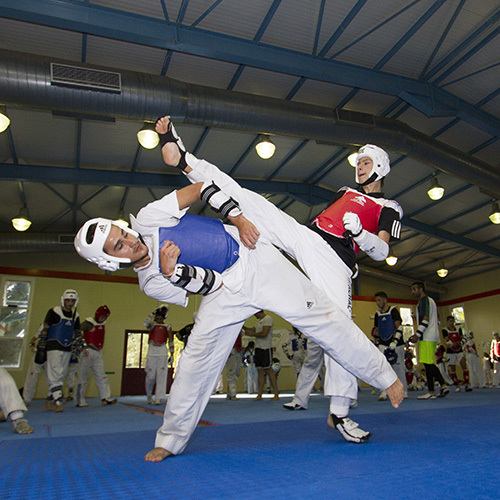 For many years, SPORTCAMP hosts raining programs and significant major events in Karate. We have a long experience in hosting sport training programs and events for top athletes, such as the Greek Olympic Champions, Ilias Iliadis and Ioulieta Boukouvala and for the National Judo Teams of Turkey and Azerbaijan. Integrated training programs for Weightlifting in our fully equipped training rooms. Gold Olympic Champions such as Pyros Dimas and Kachi Kakiashvili, many more Olympic Champions from Greece and prominent athletes from all over the world have trained in SPORTCAMP time and again. Our long experience in hosting sport training programs for the Hellenic National Teams of Wrestling is a guarantee for the level of expertise we possess in Wrestling. Furthermore, some of the top athletes of Greco-Roman wrestling that have chosen SPORTCAMP for their training are Amiran Kardanof, Artiom Kiouregkian, Konstantinos Thanos, Dimitris Avramis and many more.